New Suzuki Alto for Paris show | What Car? 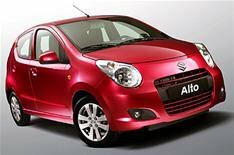 Suzuki will unveil its new Alto supermini at the Paris motor show in October. Suzuki remains tight-lipped on specific details about the new car, but claims the Alto will combine high fuel economy and low carbon dioxide emissions with a roomy interior. The car is based on the A-Star concept car that was on display at Suzuki's stand at the British Motor Show last week. Although prices have yet to be announced, expect the new Alto to cost around 6500 when it goes on sale here next spring.